This new cord has a breaking strength of 450 lbs while having a diameter of just 0.08 inches. The secret of achieving these specs is in the material. 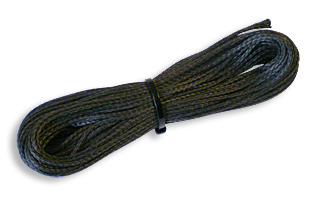 This cord is made from woven Technora®, a very high strength, low stretch, abrasion-resistant material. Additionally, its coated with PTFE which provides both increased abrasion resistance and UV inhibition. This unique cord was originally developed for a <?xml:namespace prefix = st1 />US government agency to tether some sort of top secret airborne surveillance system. It is the strongest cord in the smallest package that will hold knots. A must-have for any survival kit. Length: 50 ft. Weight: 0.8 oz. Color: dark green. Made in USA.